Prime Minister Imad Khamis on Wednesday discussed with a delegation from the Palestinian Liberation Organization (PLO) Executive Committee, headed by Azzam al-Ahmad, the current situation in the region, especially attempts to liquidate the Palestinian cause through the so-called ”Deal of the Century”. Khamis said that the Palestinian cause is the central Arab cause, expressing Syria’s appreciation for the steadfastness of the Palestinian people in order to gain their freedom and establish their independent state with Al-Quds (Jerusalem) as its capital. 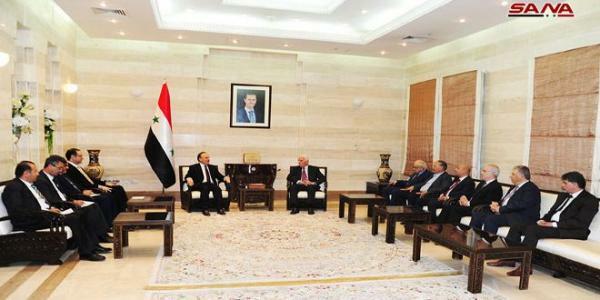 Khamis pointed out that the terrorist war on Syria is mainly aimed at dissuading it from its national positions and stopping support for the resistance, stressing on Syria’s support for the legitimate rights of Palestinian people. Later, Minister of Social Affairs and Labor Rima Qadiri met the Palestinian delegation, affirming that the Palestinian camps destroyed by terrorism will be within the state‘s plan for reconstruction, adding that the Ministry is working to cope with the social effects and damage caused due to terrorism.